If you are the ones who don’t believe in Love at first sight, your belief will be strongly tested as you behold this palatial and luxurious hotel in sight. There are very few hotels which could provide an experience that in all honesty celebrate its home city, Suryagarh was conceived with this noble idea and it is indeed a glimpse of Rajputana way of life in its hey day. If anything Suryagarh is a poetic tribute to the golden sand city. Because we are already running out of reasons why you would not get married at Suryagarh in Jaisalmer, so this conversation is entirely going to be about why you should choose Suryaragh as a venue for your destination wedding in Rajasthan. Suryaragh as a venue for your destination wedding in Rajasthan. 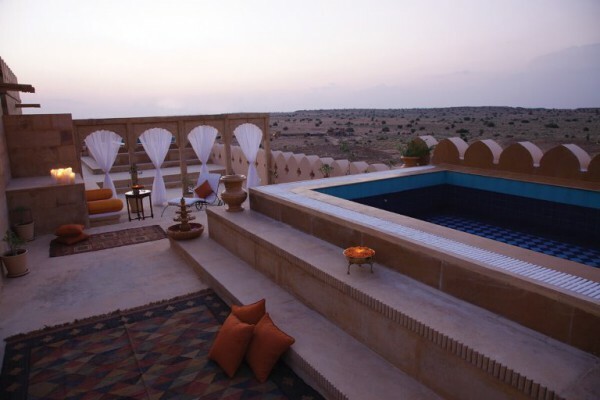 Nestled in the heart of the shimmering sands, Suryagarh is a jharokha to the mighty Thar Desert. 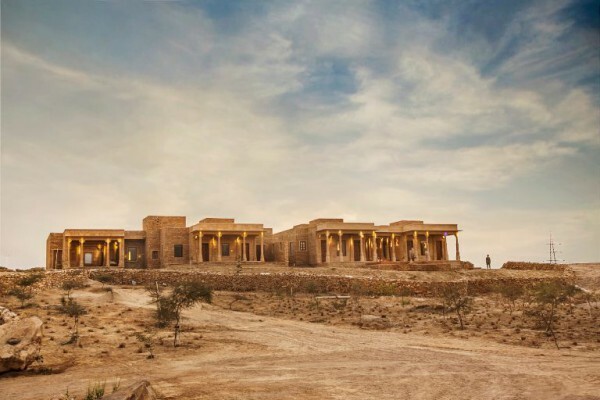 The boutique hotel has fort-like structure and is made out of yellow sandstone, which blends with the colour of the desert. The desert’s soothing aura extends to the hotel, there’s a certain kind of sereneness about it. Look through the window and there is endless shifting sand till the horizon, which could put you in a meditative state. 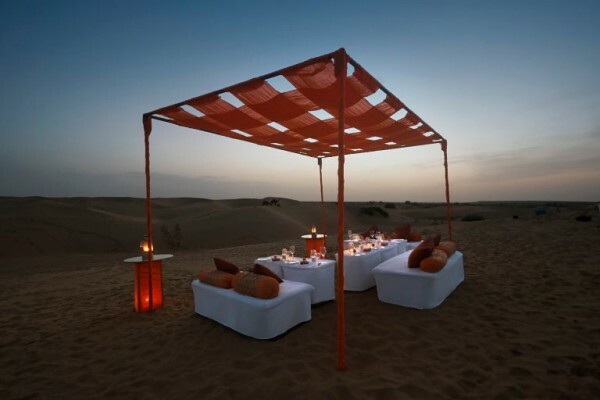 So while you are having your destination wedding in Jaisalmer at Suryagarh, it would be plainly unfair not to have an evening planned in the sand dunes. The vibrant canopies with comfortable seating and lanterns and local folk music in the background would be just surreal. Suryagarh has an array of wedding venues for your many ceremonies. The combination of courtyards, terraces, gardens and banquet rooms will give a different feel to every event, plus you wouldn’t have to repeat any venue. Sangeet and Mehendi could be organized at their Mehendi terrace while you could entertain your guests to the evening of folk music and dancing at any of their sprawling courtyard. The Bawdi designed like a stepwell is the most stunning spot to get wed. When the venue is as gorgeous as Suryagarh, you want to play minimalistic with décor and let the place do the talking. Their warm and gracious hospitality will definitely be the highlight of your stay. From the outset, you are given a royal welcome with the showering of rose petals and sounds of traditional drums and priest’s auspicious chants, you are offered signature welcome drink and this hearty spirit continues right till the check-out. Such is their hospitality that you would admire and applaud it and take some of the warmth back home. Little details or big stuff, everything that makes for a royal experience whilst reflecting the way of life at the desert, is the exclusivity and specialty of Suryagarh. 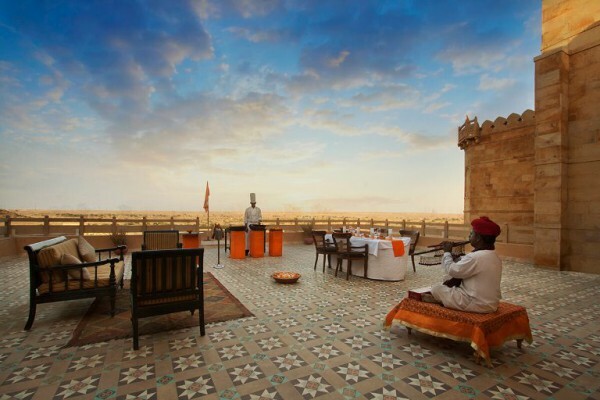 From the moment your guests arrive at this awe-inspiring fort for your destination wedding in Jaisalmer at Suryagarh they are going to love every moment here. Its rooms and suites are done with the colour palette inspired by desert tones. The Rajputana heritage finds an expression in its interiors, furnishings and details. The food deserves a special mention, be it the traditional lal maas or dal bati churma or badaam ka heluva or the regional thali, chefs dish out some of the most sumptuous food. Their ‘Halwai breakfast’ is something you got to try when you are here. 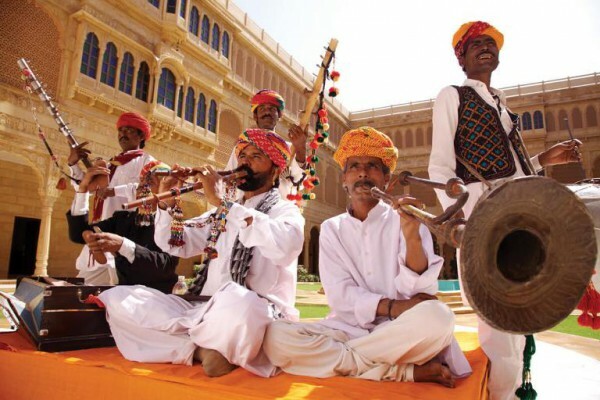 Manganiars, the traditional and highly skilled folk musicians of the Thar Desert fill the air with their soulful music and make your evenings sublime. Well understandable if you do not wish to step outside this hell of a property, but we reckon you might want to spend a day out and have a great time with your guests. We might have mentioned it earlier but we highly recommend having an evening in the sand dunes, while you are at Suryagarh. 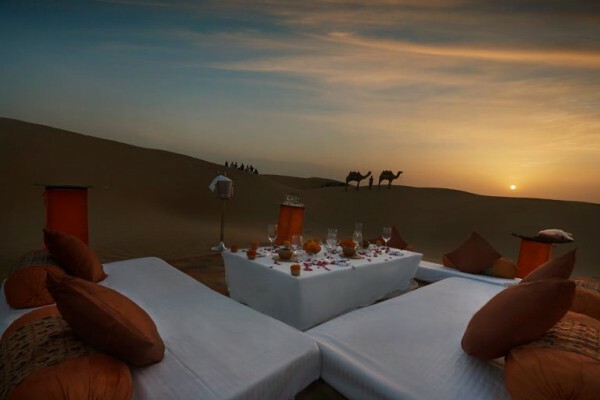 A few tents, delicious meal and local musician crooning folk music and miles and miles of sand, you have to give yourself and your guests this quintessential desert experience. And then there is breakfast with peacocks at Khaba fort at sunrise, even the sound of the idea titillates us. Their one of a kind sand massage and intoxicating spa sessions would help you get rid of the travel fatigue and will rejuvenate you. Your wedding at the Suryagarh would not just be a royal wedding in a palace but the one that is soaked in culture. And those towering sandstone walls of the fort would make for a breathtaking background to your ceremonies. There’s just one tiny practical glitch that it is approximately four hours drive from Jodhpur, but once you are here cradled in the hospitality and quiet luxury of Suryargarh, the tiredness just chips off. 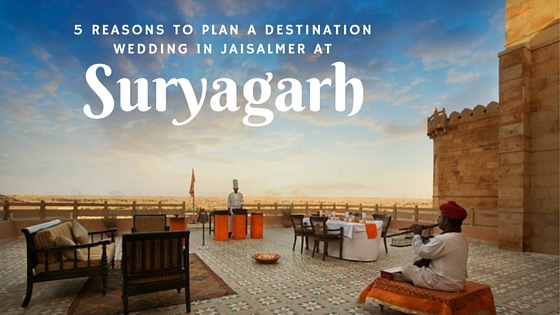 Other than that there is not one reason not to have your destination wedding in Suryarah, Jaisalmer. We as destination wedding planner are completely sold to the idea and so would you be!